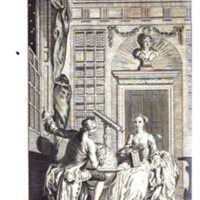 Frontispiece from Volume 1 of Benjamin Martin's The Young Gentleman and Lady's Philosophy, published in 1781. Access full text: http://books.google.com/books?id=HXgKAAAAIAAJ&source=gbs_navlinks_s Accessed on Google Books on June 5, 2013. 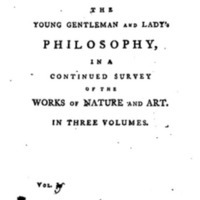 Title page of Volume 1 of Benjamin Martin's The Young Gentleman and Lady's Philosophy, published in 1781. Access full text: http://books.google.com/books?id=HXgKAAAAIAAJ&source=gbs_navlinks_s Accessed on Google Books on June 5, 2013.